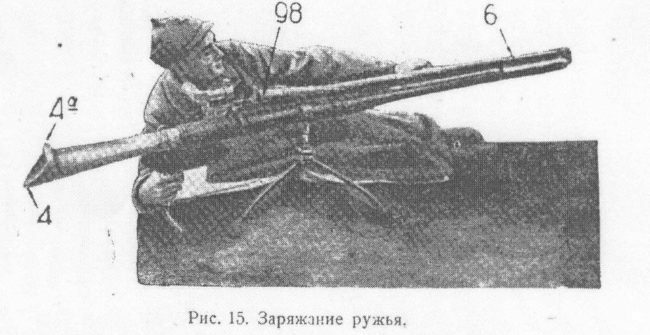 The Kurchevsky recoilless anti-tank rifle is one of the earliest examples of a weapon of this type to be adopted by a major military force, in this case the Soviet Army. Officially the weapon was adopted in 1932, and that means it predates the similar Swedish Carl Gustav Pvg fm/42 and the US M18 recoilless rifles by a whole decade. This gun was officially known as the “37mm K anti-tank rifle”, “K” being the first letter of the family name of Leonid Kurchevsky, the designer of this and many other Soviet recoilless weapons of 1930’s. As all other weapons developed by this designer, the 37mm K anti-tank rifle was quite complex mechanically, often unreliable and sometimes even dangerous in use. Furthermore, its armor-piercing performance was insufficient for the military needs of the late 1930’s with it’s claimed armour penetration of only 25mm RHA at 100 meters. For comparison, noticeably lighter and more reliable 14.5mm anti-tank rifles like the PTRD and PTRS achieved penetration of up to 40mm at the same range. As a result, by the late 1930’s the Kurchevsky 37mm anti-tank recoilless rifles were withdrawn from service and soon all but forgotten. Only a few survive in museum collections. The Kurchevsky recoilless anti-tank rifle is unusual in several aspects. Firstly, it is a muzzle-loader with a separate ignition, much the same as the early 19th century cap’n’ball rifles. Secondly, it is magazine fed, using a tubular magazine located above the barrel, which held up to 3 rounds of ammunition. Rounds were loaded into the tube from the rear. To reload the piece, the operator had to cycle the charging handle forward and back. This caused the front-most load in the magazine to pop out and fall into the loading tray attached to the muzzle. After that, a special rammer, attached to the charging handle, pushed the round back into the bore, until firmly seated against the internal collar in the breech, which opens at the rear into a Venturi nozzle. Its rounds of ammunition consisted of 37mm AP shot with a small (about 9 gram) explosive charge inside, attached to the cylindrical canvas “case” with a propellant load. The AP projectile weight was about 600 gram, the respective propellant charge was 190 grams of smokeless powder. Muzzle velocity was listed as 525 m/s, and maximum effective range against stationary targets was 500 meters. There was a dangerous back-blast area 25 meters deep. Propellant ignition was achieved by separate primers, loaded into special 10-shot strips prior to firing. Those strips were loaded into an external firing device, attached to the barrel, and fired by the gun trigger. Upon firing, the flame from the actuated primer entered the breech area of the gun via the ignition hole in the barrel, initiating a small annular charge of black powder attached to the base of the cartridge. This charge then ignited the main propellant load, sending the AP projectile down the bore and at the same time creating a recoil-compensating reactive effect by sending some of high pressure gases to the rear via the nozzle. For aiming purposes, the Kurchevsky recoilless anti-tank rifle was provided with a 2X telescopic sight. It was not intended for “off-hand” use, and was provided with a compact tripod mount, adjustable for height and with T&E mechanisms.